I’ve decided to up the ante in my efforts to try to raise the most money for my Bloggers for Movember team. In some circles what I’m doing might be called bribery or even a kickback. I guess all those years of Illinois politics taught me something. I don’t care because what I’m doing is for the greater good of Movember and that’s what is most important. They don’t know it’s a contest, but I’m hoping to stay on top anyway. Me wanting to raise the most money for my team is important, but only to me. I don’t even think the other members know it’s a contest. Maybe I’m wanting to win this because I’ve been so bad at Fantasy Football this year. Because I know things are tight right now with the holidays fast approaching, trips to be made and gifts to be bought, I’m going to reward those who take the time to donate to me as my way of saying Thank You. Not only will you receive a hand-written Thank You note from me, but anyone donating $25 or more will also receive a dozen (or more) cookies from my sister’s bakery, Sweet Treats Bakery. If you live close enough to me, I’ll personally deliver them to you. If not, they will be shipped to you so you can enjoy her tasty creations. I totally understand if you can’t donate $25, please give what you can, even if it’s $1. I’ll still sent out a personal Thank You for each and every donation, no matter how small. Donating only takes a minute and all you have to do is click HERE to get started. 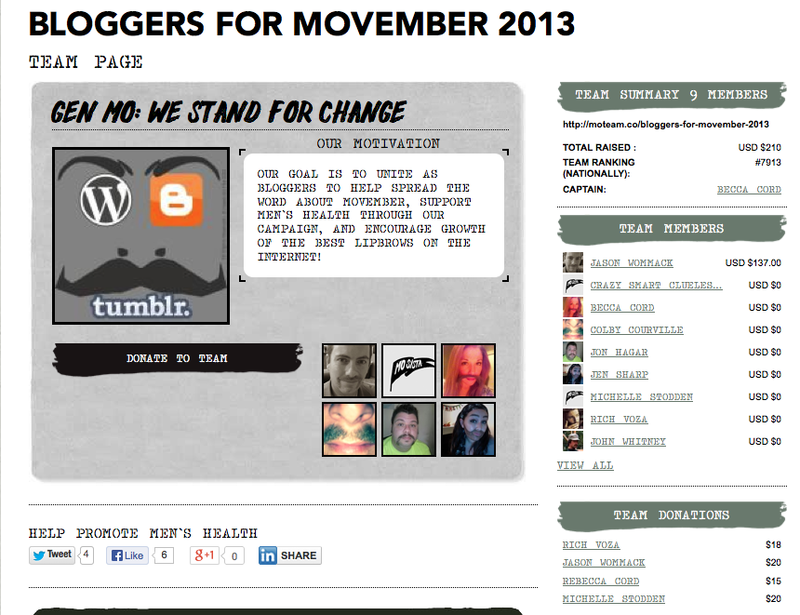 Also, please don’t forget to take advantage of some of the Movember promotions being offered by Bloggers for Movember. Dollar Shave Club is donating $10 to Bloggers for Movember for anyone who signs up for their service and uses the pro-MO code MOVEMBER081 when they check out. It’s that simple. Sounds like a perfect Christmas gift for the fellas in your life to me… Just sayin’. Becca over at 25toFly is entering everyone who donates for a drawing of a Mustache Print poster that was donated by the people over at the Charley Charwell shop on Etsy. Brother Jon is giving away Blogger Interactive swag bags and all you have to do is join the Bloggers for Movember team, like our Facebook page and donate. Mr. ChowderHead isn’t really having a giveaway as much as he is donating $2 for everyone that posts a picture of their mustache, both guys and girls are eligible, on his Movember post which can be found here. Last but definitely not least is Jen over at Sips of Jen and Tonic. She giving away 10 super awesome Jen and Tonic notebooks. One to the first five people who donate and five more to people who help spread the word via Facebook or Twitter. You can check out her rules here. There’s so much going on for Movember and there’s no excuse for not getting involved. Please give what you can. 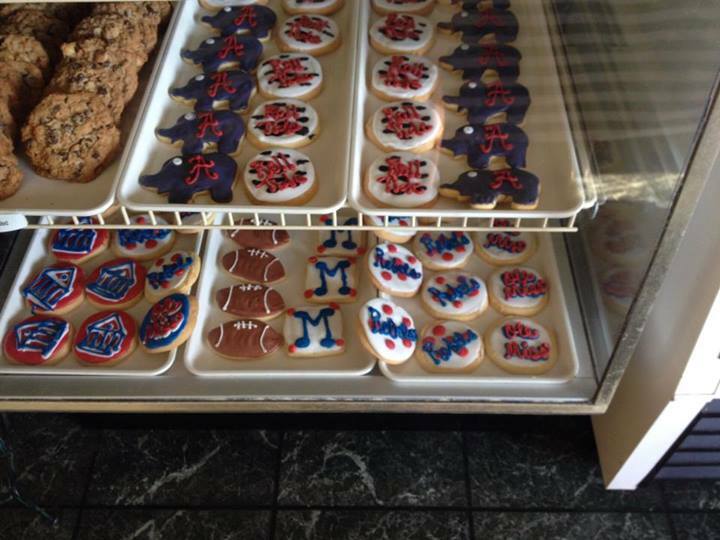 I look forward to delivering and/or sending you a personal thank you and some delicious cookies. Funds raised through the Movember US campaign go to Movember (Tax ID: 77-0714052) which is a national, not for profit 501(c)(3) organization. The funds raised by our Mo Bros and Mo Sistas support world-class men’s health programs that combat prostate and testicular cancer and mental health challenges. These programs, directed by the Movember Foundation, are focused on awareness and education, living with and beyond cancer, staying mentally healthy, living with and beyond mental illness and research to achieve our vision of an everlasting impact on the face of men’s health. Collectively, in the US, Prostate Cancer Foundation, the LIVESTRONG Foundation and the Movember Foundation ensure that funded programs align with our strategic goals. All funds donated to men’s health partners are restricted and only to be used for programs. Movember funds are not permitted to be used for fundraising or administration costs not related to program delivery. For more detail on where the funds go click here. Gallery | This entry was posted in 2013, Daily Life and tagged daily life, fitness, food, humor, life, mens health, Mental health, Movember, Movember 2013, people, Postaweek2013. Bookmark the permalink. Now I must go bake cookies. Only, I am not going to be as generous with mine. Awesome incentive Jason! There ARE a lot of great giveaways. Everyone is really rallying together for the cause. if I had known cookies were involved I would have donated more! I’m kiiiddding. Excellent work Jason – keep us posted!!! Go Jason go!!! HAHA… You gave what you could and that’s all I’ve asked. But since you WERE the first person to donate, you DO qualify for cookies.